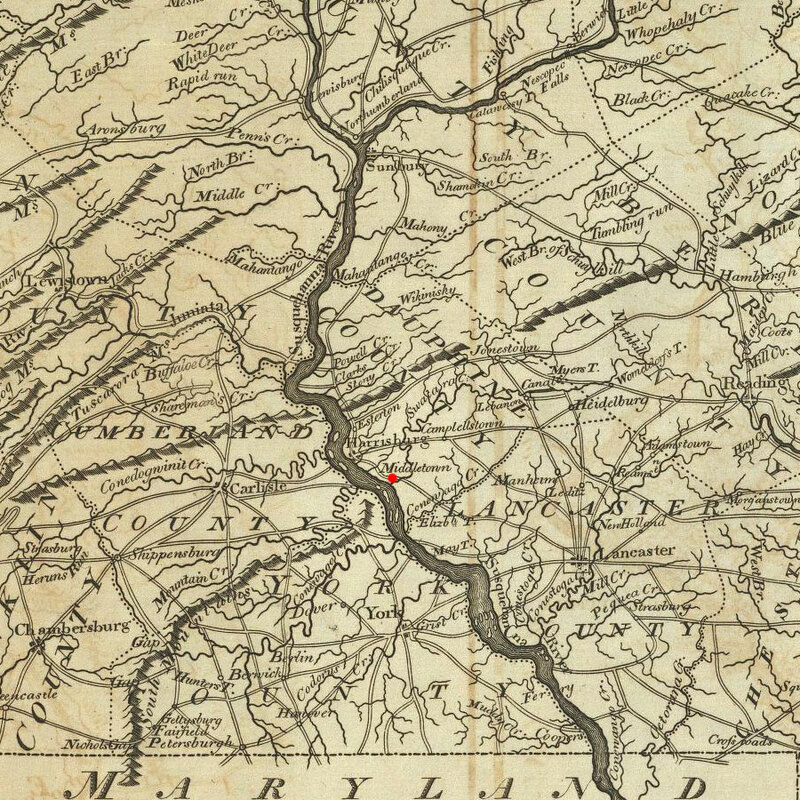 Christian grew up in the surrounding Middletown area in what was known as the township of Swatara. We believe he had a total of 13 siblings and many cousins in the area. 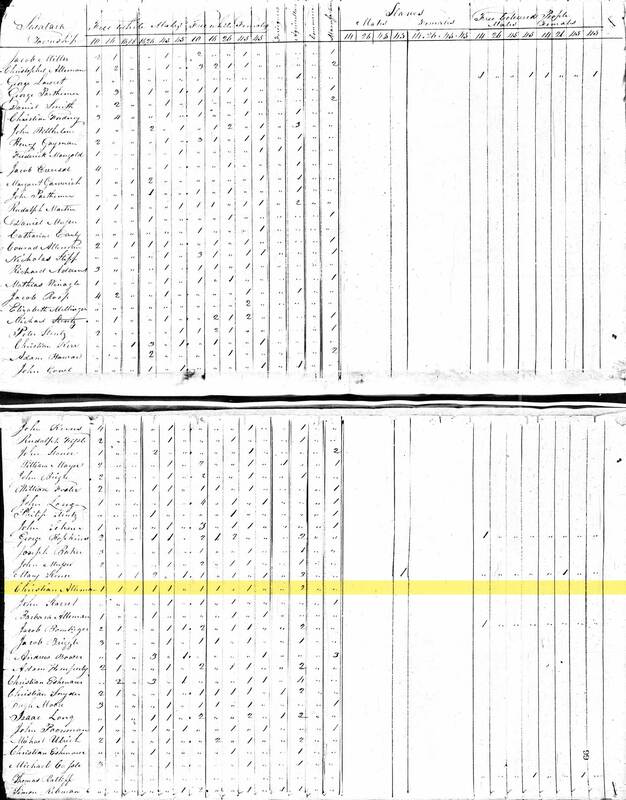 Following Magdalena were siblings Christian Jr (1808), Sarah (1811), Herman (1813), John (1814), Margaret (1817), Catherine (1818), Mary Ann (1819), and finally Barbara Ann (1820). From Christian's estate sale after Sarah's death, we know he owned at least two properties and where they were located. The first was at Twp 20, Range 14, Sect 13, SE 1/4 and the second was his home by the 1850s, next to the Lawrence Winkler family. That was located at Twp 16, Range 13, Sect 18, SW 1/4. 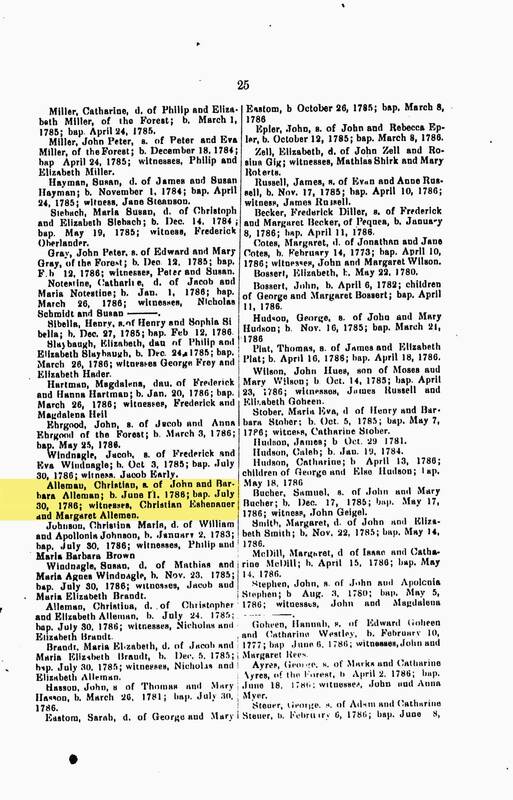 NOTE: To those questioning the accuracy of Christian's parentage, not only have I provided my sources, but I also leave this: All information to contradict this claim comes from one record on Ancestry.com from the collection "Pennsylvania, Mennonite Vital Records, 1750-2014" stating that Christian is the son of Christopher Alleman and Elizabeth Schaffner. The problem with this is that this "record" is not a record at all, but a collection of others' research from the Lancaster Mennonite Historical Society. 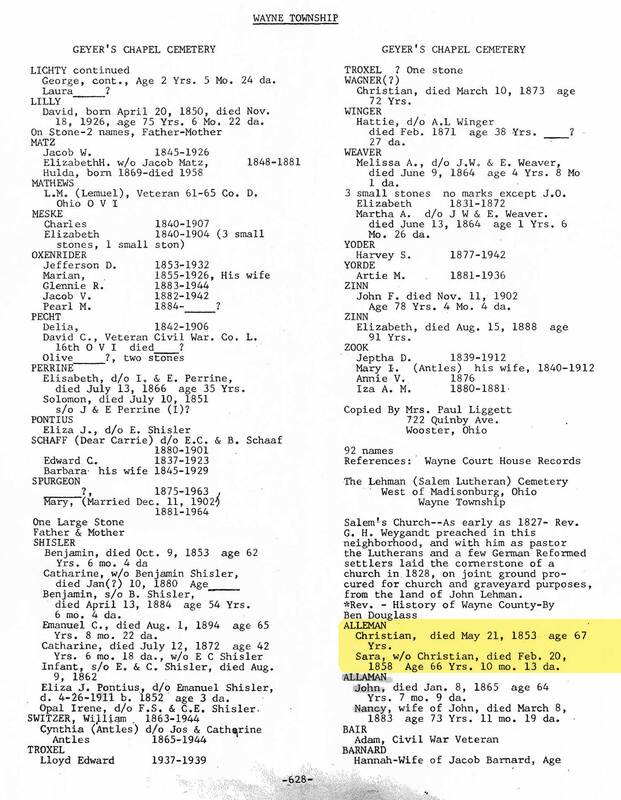 This states no sources and contradicts the vast majority of published Alleman family genealogy research including that of William Henry Egle from the Pennsylvania Archives in 1887 stating he is the son of John & Barbara. 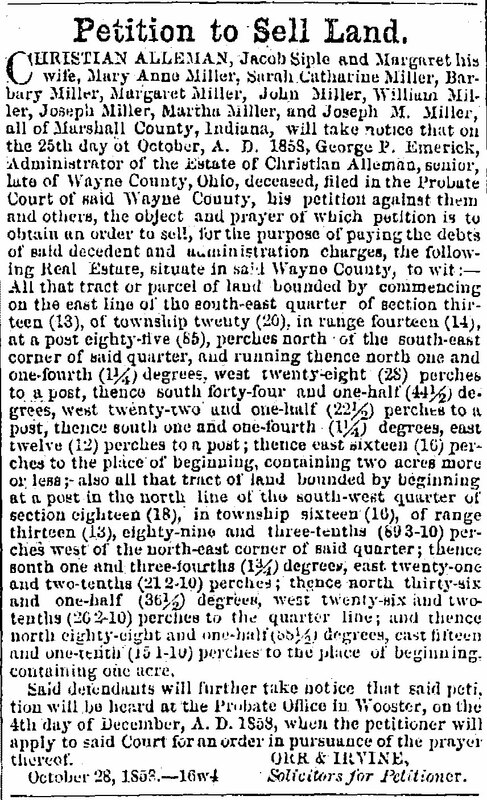 The final nails in the coffin of this argument should be not only that Christian came to Wayne Township and lived down the street from Leonard Alleman, also a son of John & Barbara (see 1840 census), but that Christian had a son named John and a daughter named Barbara after his parents and no children named Christopher or Elizabeth. He did not have any grandchildren named Christopher either. Magdalena Alleman, 28 May 1807 – ? Sarah Alleman, 17 Jan 1811 – ? John Alleman, 05 Apr 1814 – ? Margaret Alleman, 1817 – ? Mary Ann Alleman, 11 Oct 1819 – ? D I have been unable to substantiate the claims via the GLO, but common belief is Christian's father John received land in Ohio for his service as a soldier in the Revolutionary War and that led the charge west for the Alleman children into Ohio. 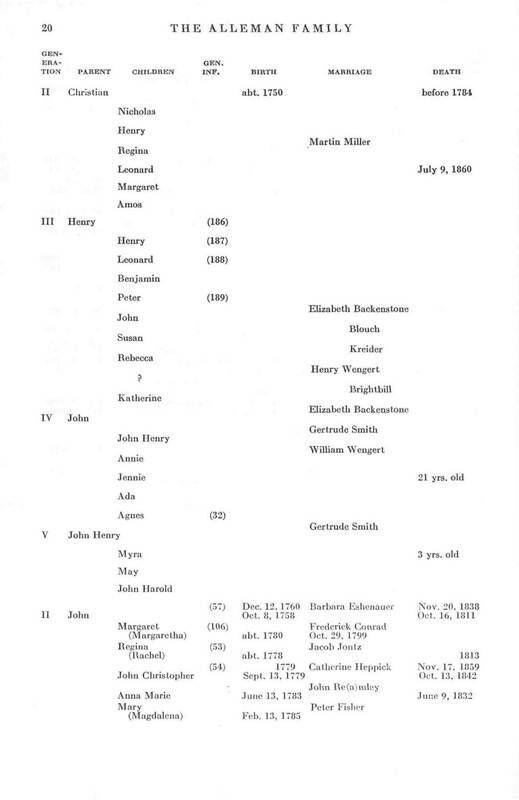 2 Alleman Family Genealogy; "Notes and queries: Chiefly relating to Interior Pennsylvania, Volume 1", edited by William Henry Egle for Daily telegraph print, 1887, pg 40. 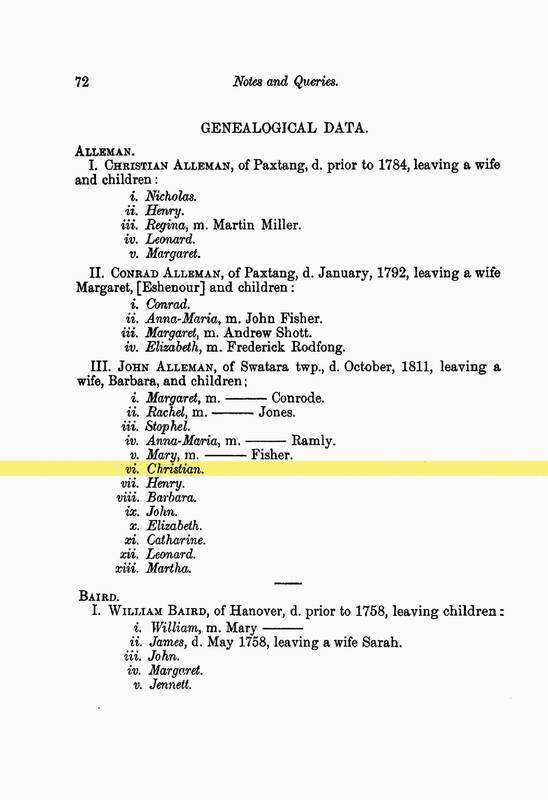 3 Baptism of Christian Alleman, 1786; Lancaster Co, PA, Church Records of the 18th Century, Vol.5, by F. Edward Wright; 2001; Lancaster County, Pennsylvania; St. Peter's Church; Ancestry.com Archives; Register of marriages and baptisms kept by the Rev. Traugott Frederick Illing. 4 Wayne County, Ohio Burial Records about Sarah Alleman; Wooster Branch of Wayne County Public Library; Wayne County, Ohio; Wayne Township; The Lehman (Salem Lutheran) Cemetery; pg. 628. 5 Pennsylvania, Church and Town Records, 1708-1985 about Christian Alleman; Historical Society of Pennsylvania; Historic Pennsylvania Church and Town Records; Christian Alleman; Marriage; Reel: 691. 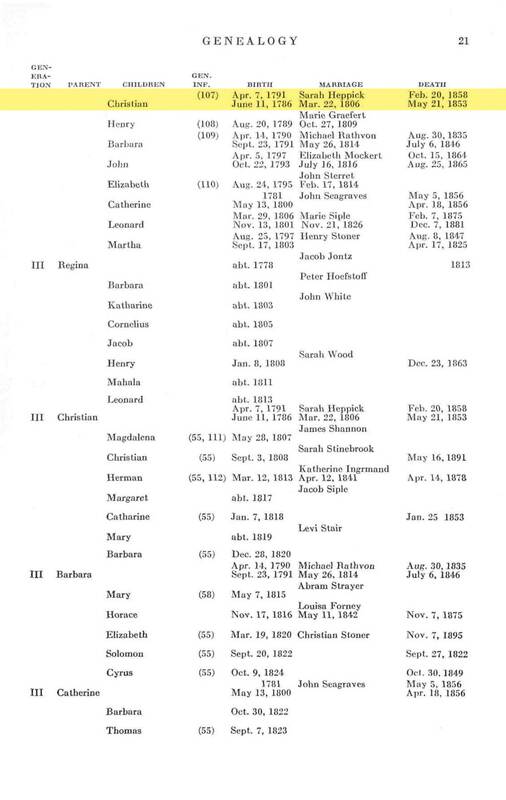 6 Baptism of Magdalena Alleman; "Pennsylvania, Births and Christenings, 1709-1950," index, FamilySearch (https://familysearch.org/pal:/MM9.1.1/V2NS-2KH : accessed 19 Jan 2014), Magdalena Alleman, 14 Jun 1807. 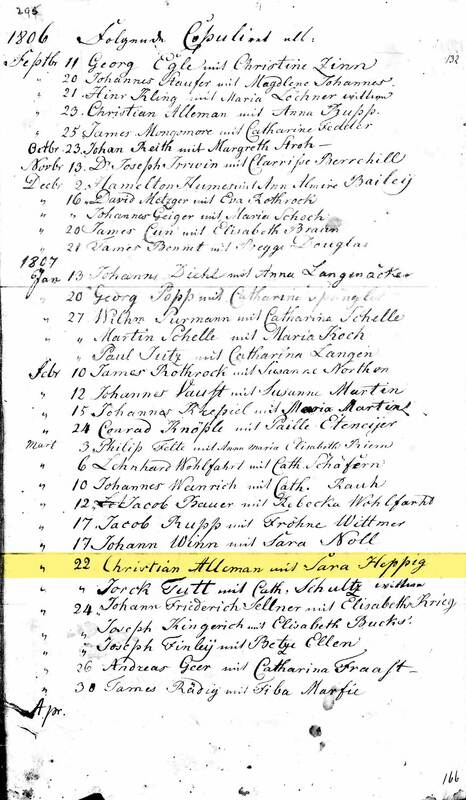 7 Christian Alleman Communion Record; Pennsylvania, Church and Town Records, 1708-1985; Zion Lutheran Church; Ancestry.com. 8 Ohio Marriage Records for Christian Alleman Jr.; "Ohio, County Marriages, 1789-1994," index and images, FamilySearch (accessed 19 Jan 2014), Christian Alaman and Sarah Stonebrook, 29 Aug 1833; citing Wayne, Ohio, United States, reference 61; FHL microfilm 425754. 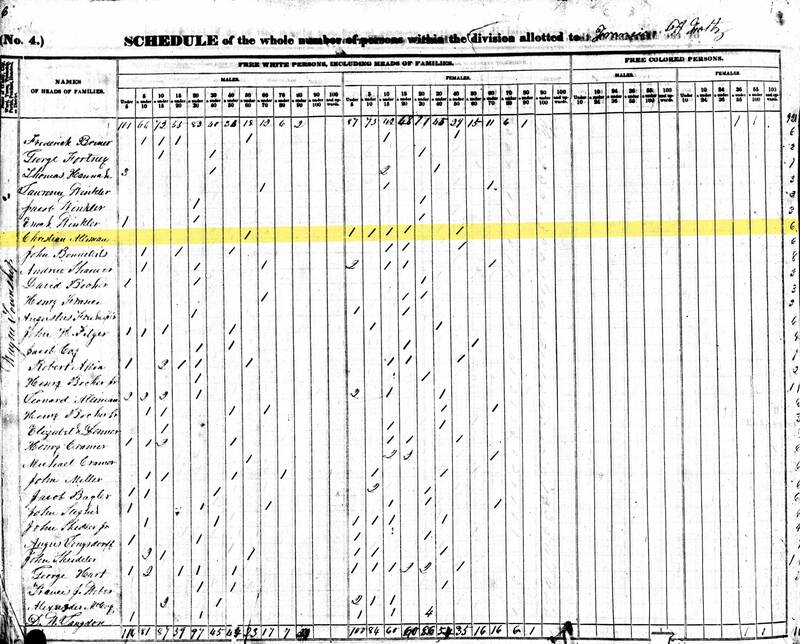 9 1840 United States Federal Census about Christien Alleman; Year: 1840; Census Place: Wayne, Wayne, Ohio; Roll: 432; Page: 70; Image: 144; Family History Library Film: 0020179. 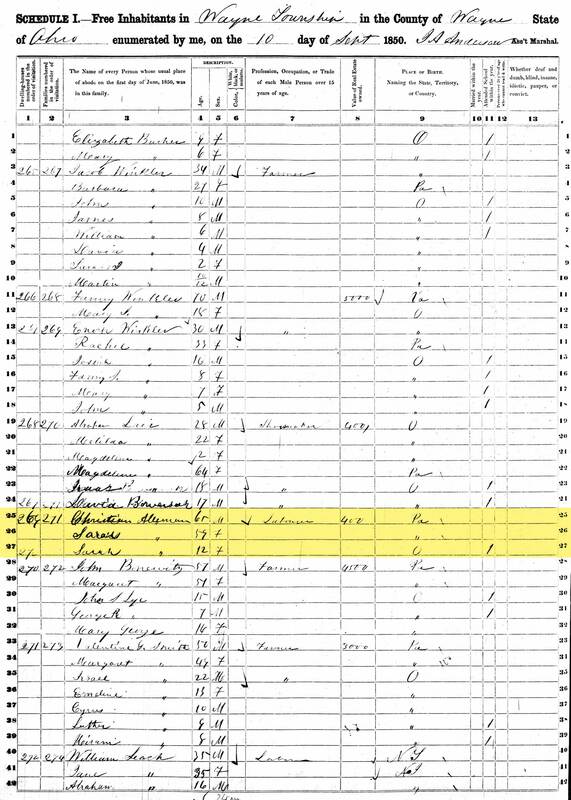 10 1850 United States Federal Census about Christian Alleman; Year: 1850; Census Place: Wayne, Wayne, Ohio; Roll: M432_740; Page: 291B; Image: 145. 11 Wayne County, Ohio Burial Records about Christian Alleman; Wooster Branch of Wayne County Public Library; Wayne County, Ohio; Wayne Township; The Lehman (Salem Lutheran) Cemetery; pg. 628. 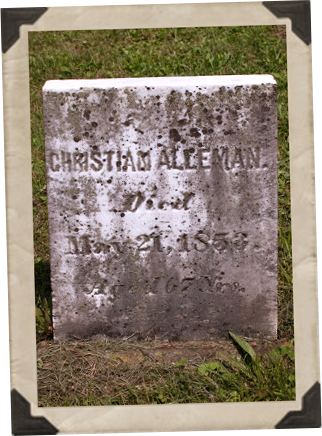 Christian Alleman, died May 21, 1853 - Aged 67 Yrs.